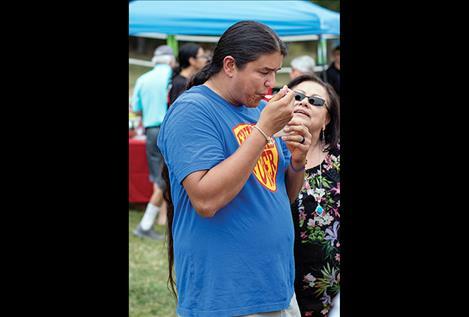 A chili connoisseur samples one of the many tasty chili concoctions. Members of the St. Joseph team scrap the bottom of the pot for the last bean. 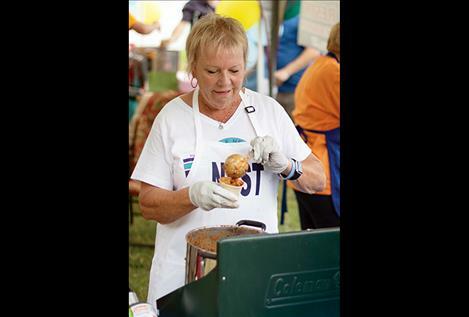 POLSON – Despite soaring temperatures, chili lovers united Saturday at Riverside Park for the 12th annual Rotary Chili Cook-off. 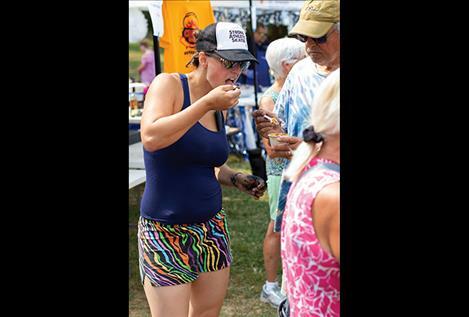 The event, hosted by the Polson Rotary Club, featured 10 talented chili teams battling for top chili honors. 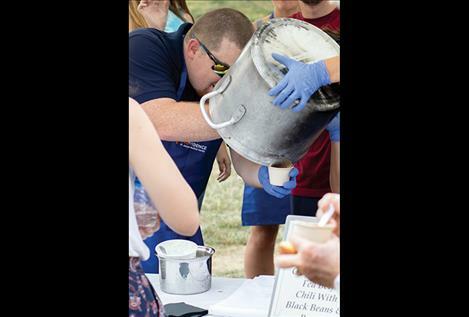 The chili cook-off is the premier fundraising event for the club’s sponsored projects throughout Mission Valley. “A lot of people came early,” noted event organizer Hu Beaver. “We have had a good turnout.” So good in fact, that several chili pots ran empty much quicker than in years past. Taking home top prize overall were co-champions Eagle Nest RV and The Red-Hot Chili Chicas. Both teams took home a trophy and $375 cash prize. Second place and a $100 prize went to seasoned competitor United Methodist Church. Proceeds from the chili cook-off will benefit the 7th Avenue Skate Park, $12,000; Mission Valley Aquatics third grade swimming program, $3,000; and Charlo Community Outdoor Complex, $12,000.